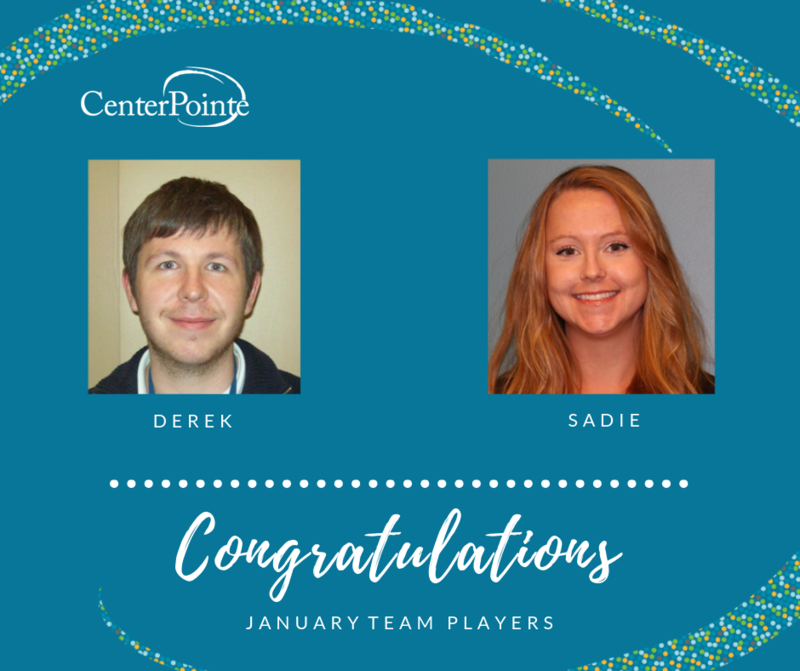 Congratulations to Derek and Sadie for being recognized as Team Players of the Month! The Team Player of the Month award goes to an individual who continually demonstrates one of the highest levels of commitment to both the clients and staff here within the Campus. Whether it be stepping up to assist on the milieu with coverage or assisting with transportation to and from appointments, he is always willing to lend a hand. More than that, he makes it a point to come in on weekends to assist clients as they make transition plans back into the community, demonstrating that their success is a goal that he shares. I would also like to speak a moment to his unfailing positive attitude, whether it be facing a new task, completing paperwork or simply lending an ear to listen to someone when they are frustrated, there is always a smile on his face and a projection of serenity in his dealings with others. All of this has lead us to name Derek our Team Player of the month! I would like to nominate Sadie for Team Player of The Month. Over the course of the last year of my employment, Sadie has shown in many ways not only incredibly strong leadership skills, but has also helped coordinate new events through the year. She has implemented groups, events, and a conference that has benefited many of our clients, as well as, others in our community. She is able to make connections with others that will leave a lifelong impact. As a peer she is a fantastic role model who understands that we are all human. Her knowledge, people skills, business abilities, and positive attitude are just some of the reasons I look up to Sadie. She continues to cultivate how we can all work better together as a team, and is always open for new ideas. I appreciate all that she does and I would like her to know that I admire all the hard work she does, and how she advocates for me as well. I couldn't ask for a better boss, or someone to look up to and grow from!